What is the single, biggest misconception about golf? For most, it is the reputation of golf itself as a sport. Many people, even golfers, doubt about the health benefits, which essentially should be the key quality of any sports. Many people believe that the health benefit of golf comes only from the walking activities between holes. Yet, is that truly the case? Actually, there are many more health benefits from golf as an activity. Not only for your body, but also in improving your mental state. Below we will debunk the myths and show you the facts about the health benefit of golfs. Let us begin with the mind and mental aspects. It is a well-known fact that in this modern life, we lose focus more easily, which is often known as the shortened attention span. The good news is, golf as a game demands a lot of focus, which in turn, will teach you to stay focused in your day to day activities. To get the most of this benefit, the best thing you can do is improving your ability to focus on the course itself. The best way is to set small goals each round, that are both realistic and challenging enough. Break the course to groups of three holes, and set a small goal for each group. We often get dismayed when making a poor score, considering the whole round is ruined by it. By breaking the course, if you make any bad score, your mindset is changed that it only hurts that sole group of three holes, and you can keep your focus for the next. Also, develop a standard pre-shot routine that calms you and helps you focus. Look at how Tour players are obsessive with their routines, and sometimes will repeat the routine when they are distracted. Not only golf demands a lot of focus during the rounds, but it also demands your fitness. Thankfully, the game of golf itself provides a lot of ways to stay fit without much effort. First, we all know a game of golf involves a lot of walking. If you really want to get the most of it, avoid golf carts and walk as much as possible. It is a great way to build stamina. Second, carrying your own clubs helps you build strong bones and muscles. Doing these two can also get rid of excess body fat, helping you stay fit and lean. Drinking more water not only regulates your body temperature and improving overall functions. It also controls your appetite, thus helping you lose weight. Specific for your golf performance, it also improves muscle functions for more powerful swings. There are a lot of smartphone apps that can help you track what you eat and drink. Some can even track your steps during a golf round. By tracking your calories, you can set realistic goals to help you stay motivated. A game of golf is a great way to let your heart pumping healthily. As mentioned, walking and carrying your bag, as well as swinging the clubs increase your heart rate and blood flow. On average, during an 18-hole round, a golfer can have an average heart rate of 100 BPM for two to five hours. Studies suggested that a male golfer burns roughly 2,500 kilocalories during an 18-hole round. Female players? Around 1,500 kilocalories. A round of golf is definitely more entertaining than spending those hours on a treadmill machine or stationary bike. The pleasure of walking in fresh air surrounded by beautiful landscape can help you sleep better at night. The social aspect of golf can also help with this fact, releasing endorphin to enhance your mood levels. This is the best part. Studies suggested that golfers have 40% lower death rate, or around a 5-year increase in life expectancy. Want to live longer and healthier? Play golf! Golf is indeed a game with many health benefits for your body and soul. The best part is, golf is arguably more entertaining than any other sports, and you can get all the health benefits without much effort. Getting over or through obstacles in life requires focusing on the target and what’s possible with a positive attitude. I once had the opportunity to meet an extraordinary person who has had to overcome tremendous obstacles from birth. Tatyana McFadden was born with a disease called spina bifida, which is a hole in the spine. Tatyana is paralyzed from the waist down. She spent the first six-and-a-half years of her life in an orphanage in Russia, without access to a wheelchair. Tatyana had some big obstacles. She did not see it that way. She wanted to keep up with the other children and play, so she figured out a way. Tatyana learned to walk on her hands. She did not accept a limiting belief that she could not play because she could not walk. When there is a will, there is a way, and Tatyana found a way. Tatyana was adopted in 1994 by an American woman, Deborah McFadden, who was then the commissioner of disabilities for what is now the U.S. Department of Health and Human Services. Although Tatyana had an exciting new life and more opportunities, her health got worse. Her family was even told that she might only live a couple more years. To gain strength with the hopes of improving her health, Deborah enrolled Tatyana in various sports programs, including wheelchair basketball, swimming, ice hockey, and scuba diving. She found her passion—wheelchair racing. Her health improved drastically, and she became an incredibly strong world-class athlete. Tatyana always rose higher than any challenge that life presented her. She made her debut in the 2004 Paralympics when she was just fifteen years old; she was the youngest person on the US Team. Tatyana won two medals in 2004. In 2008, she brought home four medals. In 2012, she added another four medals to her collection, three of which were gold. At the 2013 World Championships, she became the first athlete in history to win six gold medals at the same competition. Tatyana brought home four more gold and two silver medals from the Rio 2016 Paralympics. Always up for a challenge, Tatyana joined the professional marathon circuit. She has won the Boston, Chicago, London, and New York marathons. She is the first person, able bodied or disabled, to win the grand slam—four major world marathons in the same year. In 2016 she completed her fourth straight Grand Slam! She also competes in the winter Paralympics in cross-country skiing, winning a silver medal in 2014. Tatyana’s drive is inspiring. Her vision of the world is always about what is possible. I love the quote that reads, “Nothing is impossible…the word itself says, ‘I’m possible!’” Tatyana McFadden understands the challenge in front of her and then finds a way to rise above it. Sometimes your obstacle is bumper-to-bumper traffic and the only way to get to your destination is to go through it. Instead of thinking about the traffic and getting frustrated, focus on what you can do with that time. Whom can you call? What appointment can you make? Can you record some notes about a project or a goal you’re working on? Think about your best golf game and all of the awesome shots you have played. Make the most of your time. After all, time is precious. Use it wisely. Make your golf game and life even better by reading Golf Positive! Live Positive! What can a blind golfer teach you about your golf game? A key component to success! The golf swing is more about rhythm, tempo, and timing than it is about having a stick and smacking a ball. The approach of smacking the ball makes it challenging to be consistent. A more effective strategy is to develop a consistent movement pattern rather than relying on hand-eye coordination. Blind people play golf, which proves that you don’t have to see the ball to make contact. Jake Olson is a blind golfer who dreams of playing on the PGA Tour. Let me tell you about Jake. He was born with a rare form of eye cancer called retinoblastoma. Before he was a year old, he had lost his left eye to cancer. He fought the disease for twelve years, going through chemotherapy each time it returned. But his doctors ultimately had to take out his right eye. Jake became completely blind at twelve years old. Before he lost his sight, he played golf and football. After he went blind, Jake wanted to play football so badly that he asked himself what position he could play that wouldn’t require him to see. Remember, in Chapter 1, when we talked about asking quality questions? Jake found the answer—he could be a long snapper. When he first started, he was not very good at all. The coach put him on the team but thought there was no way Jake could play. Jake then asked the coach what he could do to improve. Jake didn’t lament about what he could no longer do. He listened to his coach and worked so hard he became a starter. “Brokenness doesn’t exist in the body. It exists in the mind, body, and spirit. Mine remains whole!” Jake said. As for golf, his goal is to be the first blind golfer on the PGA Tour. He says, “Since I’ve become blind, I see better than ever what my true potential can be.” Jake is the author of the book Open Your Eyes: 10 Uncommon Lessons to Discover a Happier Life. We can learn so much from this courageous young man. Jake is able to play golf because the golf ball is not moving, so it doesn’t require hand-eye coordination. Playing well does require him to trust his golf swing and create a repeatable move. As I watched his swing, I noticed how he used his big muscles, making it easy to be consistent. He used his upper back and shoulders in his backswing, and he used his legs, glutes, and core at the top of his swing all the way to the finish. Jake has a consistent swing. Practice chipping with your eyes closed. Move your upper back and shoulders in harmony and allow your club to swing like a pendulum back and through. The clubhead will swing through the ball and make solid contact, if you let it. If you struggle to make contact, you are relying too much on hand-eye coordination to hit the golf ball. Keep practicing! Focus on how your body and the club feels instead of ball and trying to hit it. Learn from Jake and improve your game! A finish position that resembles a professional golfer has great balance and full body rotation towards the target and beyond. Professionals making a full swing do not stop immediately after impact because they have so much momentum and acceleration through impact they have to keep going. I’m going to share with you the keys to a great follow through, how to make your follow through automatic! You might be thinking, “I already look like a professional in my finish position.” That is awesome! Listening to this audio will give you proven strategies to make sure you continue your great technique! You may question, “Is this possible? I’ve tried to get to a better follow through for years.” Yes! You can do this!! I know this because I’ve taught thousands of golfers to make an effortless yet powerful swing! When you follow through to a great finish position, with perfect balance, something good will happen at the ball! Talking about a balanced finish position and perfect pose brings me to a photo of one of the most amazing moments in golf history. The photo was taken during the 1950 US Open at Merion Golf Club as Ben Hogan held his finish position and watched his 1-iron shot fly towards the green. The shot was from the middle of the 18th fairway on the final day and Hogan needed a par to force a playoff. Photo by Hy Peskin. LIFE Magazine, 1950, TIME, Inc. It was a miracle that he was even competing as this was Hogan’s first tournament back after being in a car crash that nearly killed him. Hogan’s car collided head-on with a Greyhound bus. He fractured his collarbone, pelvis, ankle and crushed on of his ribs. The doctors told him his golf career was over. Obviously, Hogan did not accept that diagnosis, and sixteen months later, he was in fighting to win the prestigious US Open. As you know, the US Open always provides great physical and mental challenges to the players. It was even a greater test in the early days as the schedule included 36 holes of play on the final day. The physical toll of the day was almost too much for Hogan. David Barrett, author of “Miracle at Merion,” shares that on the 12th hole Hogan almost fell down, and he could barely walk after that. Hogan himself even admitted almost quitting after the 13th hole. “A winner never quits and a quitter never wins!” Hogan’s playing partner and competitor, Cary Middlecoff, actually marked Hogan’s balls on the greens because Hogan was in such agony with searing pain in his legs with every step. Hogan’s courage, mental toughness and sheer determination helped him to not only survive the day but to have the opportunity to force a playoff. Needing a par on a very challenging finishing hole, Hogan hit a drive to the middle of the fairway, and then the miracle shot … he hit his 1-iron to the green. It was Lee Trevino who said to avoid getting hit by lightening, “Stand in the middle of the fairway and hold up a 1-iron. Even God can’t hit a 1-iron.” Well, Ben Hogan could! He hit it perfectly in the perfect moment! His ball hit the green and held, Hogan two-putted to force a playoff! The next day he returned to Merion to win the 18-hole playoff over Lloyd Magnum and George Fazio. This was the second of his four U.S. Open titles. The “Miracle at Merion” as it is known, was such an amazing story of heart and strength that Hollywood would made a movie about it called “Follow the Sun” just one year after his triumph! Practice following through to a balanced finished position and you'll play even better golf! Golf Positive! Live Positive! Be Positive! 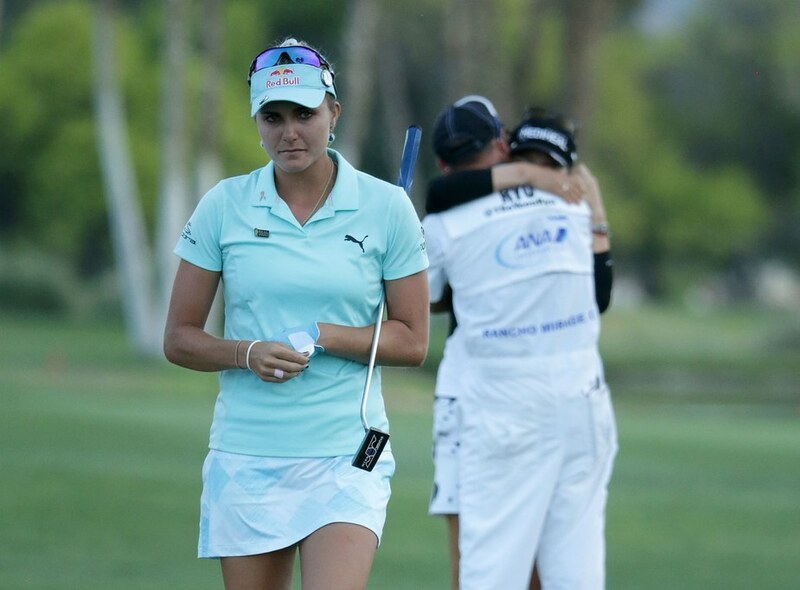 What happened to Lexi Thompson during the final round of the LPGA's first major of the year the ANA Inspiration is unfair for many reasons. I plead with both the LPGA and the PGA to put in rules and guidelines for the use of video replay and viewer input, as well as timing of penalties assessed. All sports fans are used to the idea of using video replay to make rules decisions in other professional sports. Each sport carefully debated the their respective sports would use this technology to enhance the fairness of the game. Each sport has their own set of rules about the number of times and which infractions a video replay can be engaged. Have the LPGA and PGA discussed and debated the fairest way to use video replay in the game of golf? Has their been a debate about the fact that only a portion of the field is on camera and even fewer actually on television? Have they reviewed a set of guidelines and procedures to handle the situation of viewer input and timing of penalties? Have the LPGA and PGA discussed how a players game plan changes based on the scoreboard? The USGA allows for "local rules" that are unique to golf courses, I'm sure the LPGA and PGA can include their own "local rules" for their unique situation. I hope these discussions have taken place but if not, maybe they will. The USGA is responsible to write, review and change the Rule of Golf. The job of the rules officials and the players is to enforce the rules. I believe it's the responsibility of the LPGA and PGA to make the rules about the use of video replay and viewer input (or interference as many are calling it). I understand that the LPGA Rules officials were following the rules set by the USGA. But experience should tell us that information from television viewers is unfair and not good for the game. Think back to Anna Nordqvist who was informed of a penalty for barely touching the sand in a fairway bunker during the second hole of a three hole playoff in the 2016 US Women's Open. Only a slow motion replay of the swing could have revealed the infraction. The unfair part of this story was that Anna was informed of the penalty after her third shot on the final playoff hole. Her opponent and eventually winner, Brittany Lang was informed before her third shot. This information changed Brittany's game plan - she could now play it safe. "It certainly changed her game plan," Nordqvist said. "But, you know, hopefully we can all learn from it and hopefully we can all get better. I'm not sure we learned anything. I'm hopeful the LPGA and PGA can learn from the situation with Lexi! I agree with Jane Geddes who commented after the conclusion of the tournament that there should be a "statue of limitations." The 3rd round was virtually "in the books." The tee times for the final round were set and not only underway, but through 12 holes. Professional golfers with a three shot lead play a different game than a golfer one stroke behind on the back nine. If Lexi knew she was behind would she have hit a safe tee shot on hole twelve, which ended up in a three putt? She may have played with a different strategy and tried to hit it close for a birdie. The emotional and mental strain on Lexi was tremendous. She handled it incredibly well and with total class. Dustin Johnson also had to fight hard through the mental challenge at the 2016 US Open after the delayed penalty was called on him in the final round. He was told on the twelfth tee that he might get a one shot penalty for his ball moving on the fifth green. They wouldn't know until after the round. He played not knowing if he was leading or one shot behind. Fortunately for Dustin, he stayed focused, played great and went on to victory. Again, the timing of the actual call by the rules officials seems unfair. The golf world is pleading with the LPGA and PGA to set fair standards when it comes to viewer input and timing of penalties assessed. Don't wait until 2019 for the USGA to adopt rules changes. Please, for the good of the game do something now. It's nearly impossible to be a negative pessimistic person and have a happy positive life. You will get what you focus on in life. Pay attention to your thoughts and words and make sure they are positive. If you want to live a happy positive life be sure your thoughts and words are positive. It's important to watch your language! Below find a list of disempowering words and the empowering word you can say and think in its place. If you change your language and your thoughts, your life will be even better! Be Positive ... it's worth it!! I read an awesome article in Fortune.com giving career advice to working women by Diana Middleton. As in golf, most of the time women are the minority in business and especially at a board room table. This can be intimidating, but it doesn't have to be. The article shares that often times in business women are more focused on their level of competence rather than their level of confidence. Confidence is a key to success! Competence is also important but men will often advance in a company or get their ideas heard because of they exude confidence. Many women who are fully competent may still appear lacking in belief. Here is some advice from Diana's article, "If you find yourself in such a situation, but are feeling insecure, it can be difficult to act confidently. One way to find courage is to utilize confident body language. Leaning back in your chair and taking up space in the room display a sense of self-assuredness. Speaking with authority in a calm voice is another sign." Body language is a key to success on the golf course as well. As you approach the tee keep your chest out, chin up and shoulders back. When you are waiting to hit your shot stand in a "Wonder Woman" pose. Sometimes you need confidence just to say yes to an invitation to play golf as an informal networking opportunity. Stand tall and give an authoritative, "Yes!" to playing golf. Too many women decline these opportunities because they don't feel like they are good enough. The key is more confidence, not hitting more range balls! You can create that confidence with body language and positive thoughts. The article concludes by saying, "The next time you're in a room filled with men, don't worry about having a fully formed idea before speaking. Just speak up—and with force. Having a passionate voice is more important than having no voice at all. Harness that passion confidently in your body language and speech. Take up space, embrace your confidence, keep calm, and lead." Show up confidently on the golf course as well! Enjoy an even better life with an attitude of gratitude! As one year closes and another begins I spend time reviewing the past and planning for the future. In thinking back to 2016 I became filled with gratitude for all that I have in my life. As I thought about the wonderful people in my life, my coaches and mentors, all I’ve learn and accomplished both personally and professionally, all of the extraordinary activities, vacations, meaningful moments when my emotions were stirred, I realized that I may not remember everything. This realization lead me to want to create a new ritual in 2017. I put a jar in my bedroom along with a small pad of paper and pen. Each night I will write down one or more things I experienced or thought about that I am thankful for. The note will then be placed in my “Thankful Jar.” At the end of the year, I will take some time to read each of the thankful notes. I can just imagined how filled with happiness I will be as I remember what I was thankful for each day of the year. My morning ritual begins with this question, “What am I thankful for?” I take a few moments to reflect on the many wonderful aspects of my life. I start with my family and friends - people I love and who love me - and I feel loved. Next is usually an experience, accomplishments or opportunity in my life that truly moves my emotions. I finish being thankful for a couple of things that could easily be taken for granted like chairs, music, cars, airplanes, brilliant researchers and doctors, my sight, hearing, taste buds, legs and arms. All of these thoughts create of flood of happy emotions! My day is off to an amazing start! Research shows that people who have an attitude of gratitude live happier healthier lives. Seven of the scientifically proven benefits are revealed in this article by psychotherapist and author, Amy Morin. I invite you to join me in filling a thankful jar with notes of gratitude each night. At the end of 2017 we’ll take some time to read the notes and recall the wonderful memories and feel the joyous emotions those moments elicited. Let's also even share our thankful messages on my Facebook Page throughout the year! Thank YOU! Have an amazing 2017!